Very Nice but.......Roosters cackeling all day. Room needs carpet replaced. Everything else great. The Kulakane is a hidden gem in Maui. Excellent location, fabulous ocean front and views from any of the condo units. However, Unit 208 was disappointing. This unit needs significant updates including a replacement of the carpet, the bed mattress and the sitting room furniture. There was not one place in this unit that was comfortable to sit or to sleep. 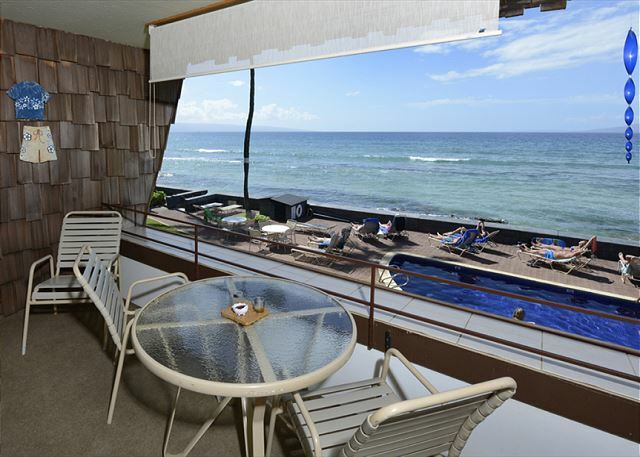 The lanai was in good shape with an excellent view of the ocean and for whale watching. The overall property of the Kulakane is well managed and clean. We will be back but not in unit 208. Convenient Location but Unit 208 needs updating! My mum has been staying in a certain unit here for many years, so she wanted some family members to all be able to stay here at the same time.Debbie did an outstanding job of accommodating/updating our requests. She’s great! The laments we had are specific to RM. 208, in that it’s VERY dated, very few lamps, or outlets. The carpet(while supposedly cleaned the day of move in) is so old, I couldn’t even tell. The unit is small, but it was okay for 3 people, but with limited lighting and outlets, it was hot, dark and sweaty trying to get primped for evenings out. Too hot in the tiny bathroom. The shower could use a shower caddy too. My daughter slept on the pull-out couch which was VERY uncomfortable. All the pillows were weak/flat/cheap and top bedding doesn’t seem to have been cleaned, not recently anyway. Clean, comfortable bedding/linens/mattresses are MUST haves and aren’t that expensive to provide and update. The condition of our unit compared to others we saw, was why I gave 3 star ratings. The bedroom screens or windows were so dirty that during really strong wind some nights, there was sand/grit/??? Streaming into our faces as we lay in bed! Even when we closed the side windows, it came from the top windows. It was too hot to close up everything. Our face/linens were covered in grit and dirt, it was disgusting. Also, the back/left burner doesn’t seem to work, but the ice machine worked well, unlike my Mom’s I.M. The fridge will freeze anything in the back/middle so be careful. One plus was there are 2 BackPack style beach chairs which were very handy. The property is quiet on the ocean side, but noisy roadside which is where the bedrooms are. There no elevators, but that wasn’t a problem for us. HIGHLY RECOMMEND THE KULAKANE! I HAVE STAYED IN THESE CONDOS FOR OVER 30 YEARS AND WILL NEVER STAY ANYWHERE ELSE.LOCATION IS AWESOME. LOVE BEING ON THE LANI ENJOY THE VIEW AND WATCHING THE TURTLES AND WHALES WHEN THERE HAVING THERE BABIES. THE MANAGERS ARE GREAT AND SO FRIENDLY. Great location! Friendly staff. Condo decor dated, but had just about everything I needed. Definitely coming back.